Adham Fisher leaped from the steps of the Red Line trolley onto the concrete of Mattapan Station on Monday afternoon and let out a groan that conveyed a mix of achievement, relief, and disappointment. Eight hours, five minutes, and 16 seconds. It was just a bit over the eight-hour goal he had set for himself, but it would not have been a marathon ride on the Massachusetts Bay Transportation Authority if things were not running a little behind schedule. “I had hoped it would go a little more quickly than it did,” said Fisher, 29, a native of Leicester, England. Still, the transit-riding aficionado set a new record for the shortest amount of time to ride the entire MBTA subway system, beating a previous record of just under 12 hours, documenting his trip with photos and signatures from fellow commuters who witnessed his travels. 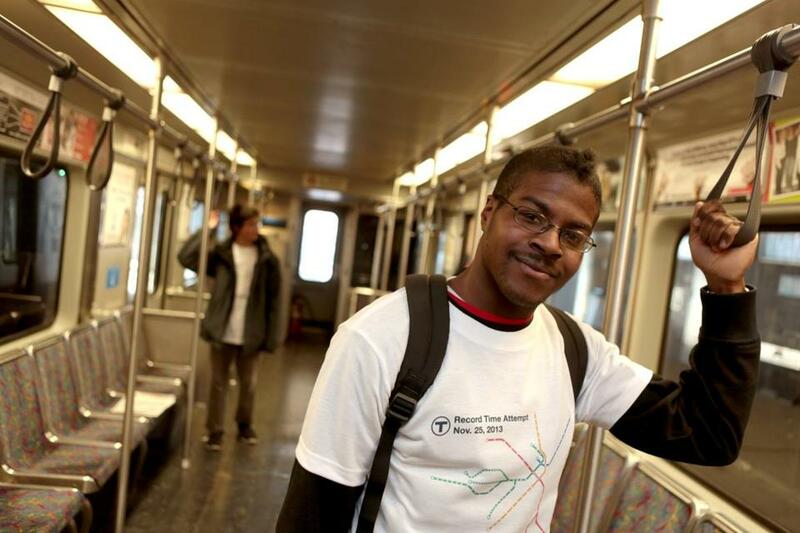 He is sharing the accomplishment with Miles Taylor, a 13-year-old transit blogger from Cambridge whose parents allowed him to skip a school field trip to accompany Fisher on his travels through the T system. Fisher was mum on the details of his trip, declining to say where they had started or what route they took. Even with the logistical challenges familiar to any MBTA rider — crowded cars on the B branch of the Green Line made for slow going, he said — other parts of the system impressed him. “I was quite taken with the Blue Line,” he said.